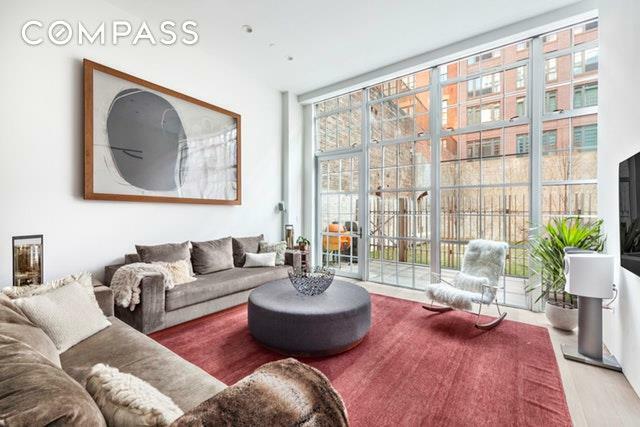 Indoor / Outdoor living in the heart of DUMBO! 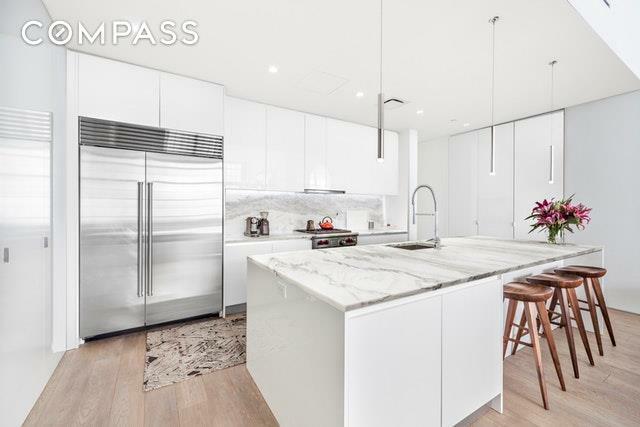 Brand-new and meticulously finished 4-bedroom, 3.5-bath loft with 14-foot ceilings, stunning designer finishes, and a combined 2,850 square feet of private indoor and outdoor living space. Never wait for an elevator again! Maintain your privacy and access the loft directly from the ground floor lobby and from the connected underground parking facility.Experience true indoor/outdoor living, cooking, and dining with three separate points of access to a professionally designed, 550 square foot private garden patio with shaded pergola that spans the full 60-foot southern expanse of the home. The private landscaped garden, filled with lush trees and plants, comes with automated lighting and irrigation and the private outdoor kitchen and dining area features a professional-grade built-in Lynx BBQ cooktop. A gate opens from the patio to an adjoining 3000 square foot landscaped sunken courtyard with a rich lawn and garden area with private access to parking.Brand-new and meticulously upgraded throughout, this four-bedroom, three and a half bath, floor-through loft features stunning designer finishes and nearly 500 square feet of private outdoor space in the heart of coveted DUMBO.Graced by floor-to-ceiling windows to the north and south and topped by 14-foot-tall ceilings, this impeccable 2,300-square-foot residence is flooded with an airy, sun-kissed ambiance throughout. Arrive in the gracious foyer, flanked by a wide closet and powder room, and be drawn to the spectacular 32-foot long great room paved in wide-plank, radiant-heated Siberian white oak flooring. Just outside, the professionally designed patio spans the full 57-foot southern expanse of the home with distinct areas for the outdoor kitchen, dining and lounging. Inside, chefs will delight in the well-appointed open kitchen featuring custom cabinetry and a pantry, marble counters and backsplashes, and top-notch appliances by Wolf and Sub-Zero, including a gas range, dishwasher and wine refrigerator.The oversized master suite is tucked down a long hallway for optimal privacy. 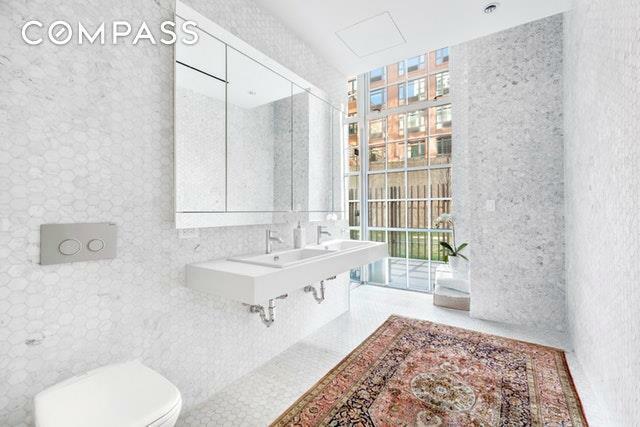 Here, you'll find abundant outfitted closet space and direct patio access, while the en-suite bathroom features swaths of Blanco Carrara marble tile, an oversized glass shower and a double vanity. Another full bedroom suite is located here, and two more large bedrooms share access to the third full bathroom in the home's northern wing.Chic designer lighting, including chandeliers by Lindsey Adelman and Francisco Gomez Paz, runs throughout, and windows are covered with custom motorized shades, with both lighting and shades controlled by Lutron switches and smart home integration. Custom cabinetry and shelving provide handsome architectural detail and storage, and the oversized laundry room is equipped with a full-size side-by-side washer and dryer.Built in 1950 and located within the DUMBO Historic District, 200 Water Street is a premier example of the "daylight factory" architecture that defined manufacturing spaces in the early 20th century. 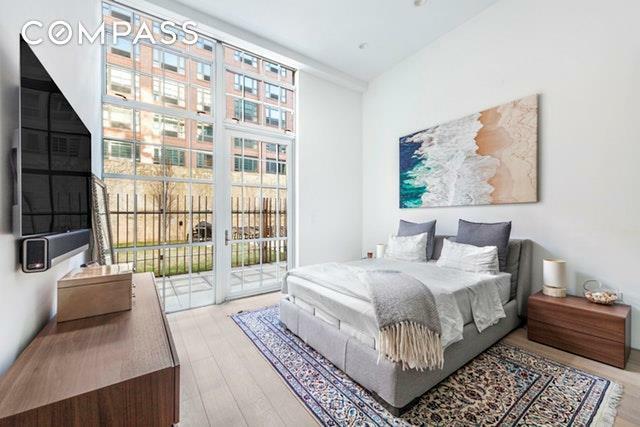 Built by the Brillo Company, and converted to condominium use in 2015, today's residents enjoy an attended door, a landscaped garden, gym, bike storage and garden accessed parking garage. There are only fifteen units in this exclusive boutique building.Located in DUMBO, one of the city's most sought-after residential enclaves, you'll enjoy easy access to magnificent Brooklyn Bridge Park offering 85 acres of waterfront outdoor space and recreation. Fantastic dining and nightlife line the nearby streets, while the Empire Stores and St. Ann's warehouse offer great shopping and entertainment. Abundant transportation options, including F, A/C and 2/3 trains and the Fulton Ferry Landing, provide excellent access to the rest of the city.